A pair of former special agents with a Department of Defense law enforcement agency told the Washington Free Beacon they complained about breakdowns in information sharing between the military and the FBI decades ago but were ignored. The ignored warnings combined with multiple inspector general reports paint a picture of a decades-long failure by the military in sharing its criminal history information with the FBI, a failure that the Air Force admitted led directly to the Texas church shooter's purchase of firearms despite a disqualifying criminal history. The Department of Defense Office of Inspector General (OIG), the military's official watchdog agency, has completed at least three investigations indicating that record sharing was a continuous problem. It is currently engaged in two active investigations on the matter. 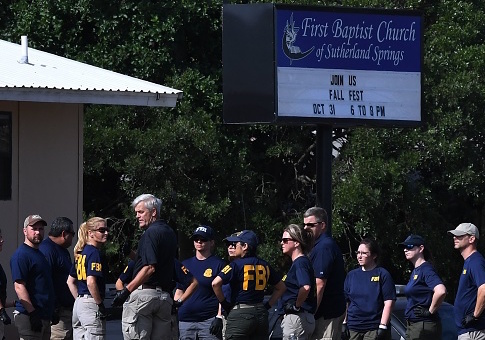 Robert Koger and Don Bolte, former special agents with the Defense Criminal Investigative Service (DCIS), told the Free Beacon they complained about the lack of information sharing decades before the Texas church shooting. "About 25 years ago, we discovered that the military services were not properly reporting to the FBI information on deserters and criminal conviction," Koger said. "We pointed it out to the Department of Defense Inspector General's office, and they kind of shinned it on." The two men said they noticed the issue while hunting and arresting long-overlooked military deserters with serious criminal records. "We were going out together as partners and trying to find these guys, people who had absconded from the law," Bolte said. "We found all kinds of guys. It was amazing. I mean, I was flabbergasted. It was only two of us. I only picked the really, really good ones. We probably did 25 or so. I probably went through a couple hundred that had been sitting there, some of them were 10 years old. I'll bet you can go to the U.S. Attorney's office all over the United States and find military people that had the military charge them with something, put them in for desertion, and it's not just desertion. Most of the time somebody deserts for a reason." They said that while the military was reporting the desertion charge to the FBI's National Crime Information Center (NCIC), it was not reporting any additional or underlying charges. They argue this puts both civilian law enforcement and the public at risk. "There was nothing on NCIC to report that there were underlying charges or the guy had escaped, similar to the guy in Texas," Bolte said. "The problem there is, obviously for regulatory purposes, if the guy is a convicted felon or has spent time in a mental institution, they can't get a gun. It's an officer safety issue for people that would contact this individual because there's not enough underlying background information to find out whether the guy has used a gun before, has been violent before, has a mental problem, you know, whatever." Koger felt strongly enough about the dangers presented by the lack of information sharing that he said he contacted Randall Murch, a friend working in the FBI at the time, and retired 4-star general Willian G.T. Tuttle Jr., who he'd worked with in the past, for help. General Tuttle couldn't be reached for comment but Murch confirmed they discussed the reporting issues. "Yes, I was aware," said Murch, who currently works as a professor at Virginia Tech. "I clearly remember that we talked about it." Koger said Tuttle was able to cause enough of a stir within the OIG that he received a call two days after his initial complaint asking that he explain the problem again but was brushed off once again. "They shifted me off to some oversight office within DOD IG and it was like ‘ok, so what? Go away. You're just a lowly street agent and we're concerned with other things,'" he said. "They're more concerned with looking good than putting people in jail." "The response was ‘we'll look into it' and that's where it died." The two men said eventually they were told to stop pursuing deserters because their superiors viewed it as outside of their purview. "It was kind of frowned upon that we were kind of making the services look bad because they didn't follow up on their investigations," Bolte said. The two men were reminded of their complaints when news broke of the shooting at First Baptist Church in Sutherland Springs, Texas. The shooter, 26-year-old Devin P. Kelley, was prohibited from owning firearms based on a court-martial record of his violent assault of his wife and stepson in 2012. However, he was able to pass a number of FBI background checks to purchase several guns over the years because his criminal records were never reported to the FBI. "Initial information indicates that Kelley's domestic violence offense was not entered into the National Criminal Information Center database by the Holloman Air Force Base Office of Special Investigations," Ann Stefanek, an Air Force spokesperson, told the Free Beacon in the aftermath of the shooting that left 26 dead. "The bureau can't do their job of oversight if they don't get the information," Bolte said. "The NCIC is only a computer system, if you don't put the data in, nobody knows about it. I'm concerned about if nothing changes. Whether we catch the guy or not, it'd be nice to be able to keep him away from getting a gun if he isn't authorized to get a gun." "To my mind, nothing's been done. All these years and nothing's been done." OIG said they could not confirm or deny the details of the two former agents' claims and could not, after consultation with legal representation, confirm or deny their employment history. "We aren't able to confirm this," Bruce Anderson, OIG communications chief, said. The agency did confirm that they had released at least three different reports on the matter of sharing criminal information with the FBI, including one in 1997. Each report found the military had failed to fully comply with their statutory obligations to report such information. The 1997 report found military criminal investigation organizations were "not consistently submitting criminal history data to the FBI criminal history files." It said massive gaps in fingerprint record sharing were common across all military services with the Army failing to submit the records in 82 percent of the cases surveyed, the Navy failing 83 percent of the time, and the Air Force failing 38 percent of the time. It also found the three branches failed to share arrest reports most of the time, with the Army failing 79 percent of the time, the Navy failing 94 percent of the time, and the Air Force failing 50 percent of the time. "As a result, the lack of reporting to the FBI criminal history files prevents civilian law enforcement agencies from having significant information on military offenders," the report concluded. A 2014 OIG report found the military didn't report any criminal records to the FBI's Uniform Crime Report despite a federal law requiring it to do so. "The FBI uses the data to develop a reliable set of criminal statistics for U.S. law enforcement agencies," the report said. "We found DoD does not report criminal incident data to the Federal Bureau of Investigation (FBI) as required by the Uniform Federal Crime Reporting Act of 1988 and DoD Directive 7730.47." A 2015 investigation examined whether the military branches had improved their reporting of fingerprint and arrest records. While the report found improvement in the percentage of records being reported, it still found large holes in the system. It found 72 percent of fingerprint records were properly submitted while only 70 percent of arrest records made it to the FBI. OIG is currently looking into how the military has complied with a directive first implemented in 2014, an evaluation they began in February. In response to a request from Defense Secretary James Mattis in the aftermath of the Texas shooting, OIG has initiated another evaluation of the military's process for submitting criminal information to the FBI. It's unclear when either of those evaluations will be completed and made public. Congress has made efforts to improve reporting of criminal records to the FBI's background check system. In 2007, it passed the NICS Improvement Amendments Act, which created an independent statutory obligation for federal agencies to report disqualifying criminal records to the National Instant Criminal Background Check System (NICS). Congress is now considering another bill, the Fix NICS Act of 2017, to again try and plug holes in the system. Koger and Bolte believe if their warning had been heeded, the Texas church shooting may have been avoided. "It's come back to roost," Koger said. "You don't pay attention and, guess what, now we suffer the consequences." This entry was posted in Issues and tagged Department of Defense, FBI, Gun Control. Bookmark the permalink.